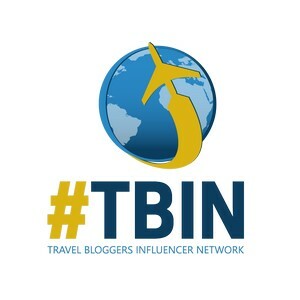 Seduced By A Schooner ~ A Tall Ship Tale! This poem has always evoked a yearning within me for a tall ship experience. 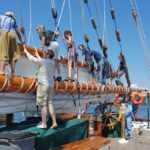 That dream of mine was realized this summer when I joined the historic tall ship, Schooner Zodiac, on a sailing adventure for women only, dubbed the “Nauti-Girls Cruise”. For me, I couldn’t find the lonely Masefield referenced, as I found myself among a fabulous group of fun-loving women sailors and adventure-hounds! The Zodiac, the last American pilot schooner, sails out of Fairhaven Cruise Ship Terminal in Bellingham, Washington. 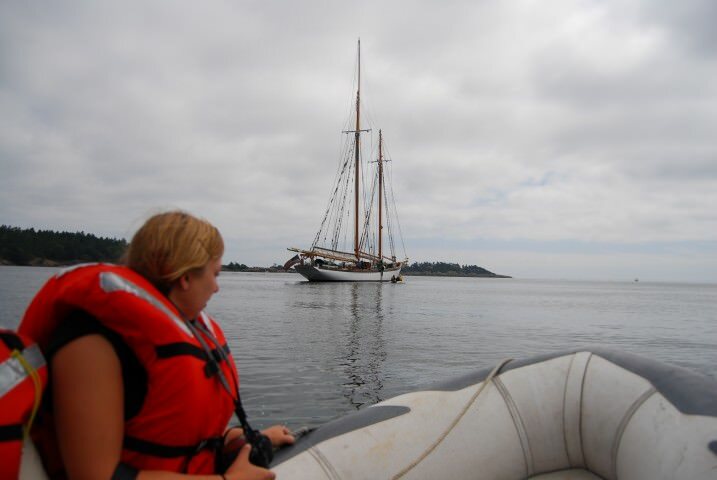 This two-masted, gaff-rigged schooner has the largest working mainsail on the west coast. Designed by William H. Hand, Jr. and built for the heirs of the Johnson & Johnson family, she was first launched in 1924. 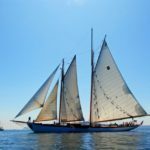 With an overall length of 160ft, a topmast height of 127ft, 7000sf of sail area and at 146 tons, The Schooner Zodiac is a sight to behold! 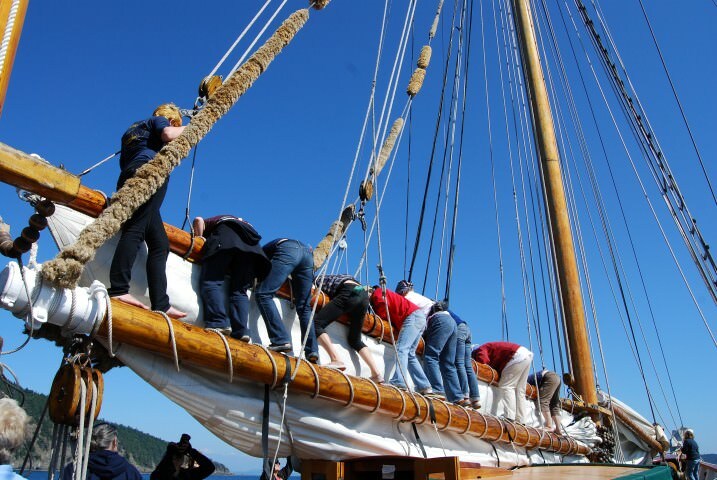 Now owned by Vessel Zodiac Corporation, the schooner has enjoyed over 30 years of loving restoration and plies the waters of Puget Sound & the San Juan and Gulf Islands. Since 1982, The Zodiac has earned recognition on the National Register of Historic Places. Under a blissfully sunny sky, the July “Nauti-Girls Cruise” departed the dock with a group of women, strangers ~ soon to become friends. I think we were all filled with awe tinged with a tentativeness about our new surroundings. The Zodiac with all its varnished wood, tackle, booms and sails presented a powerful image. For the next three days/two nights we were going to channel that power and become empowered as women working together to learn a new skill or embellish what we already knew and actually sail this magnificent tall ship. Our group was comprised of 17 women passengers complemented with a crew of a dozen, five of those being men. The men, appreciating the mission of this particular women-only cruise, were most respectful and were low-key with their presence. 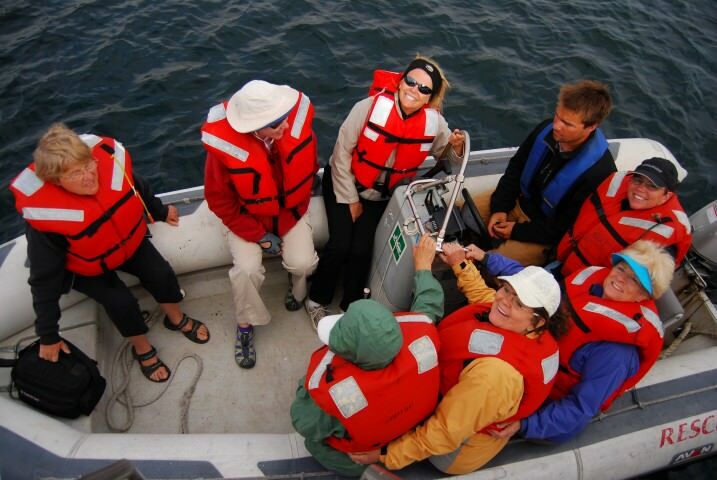 The age range of our fellow sailing passengers was mid-twenties to mid-sixties. After being assigned our bunks for the next two nights and instructed that our mugs hanging from the galley ceiling were numbered according to our bunk number, we had time to help ourselves to coffee and muffins as Zodiac cruised into Bellingham Bay. 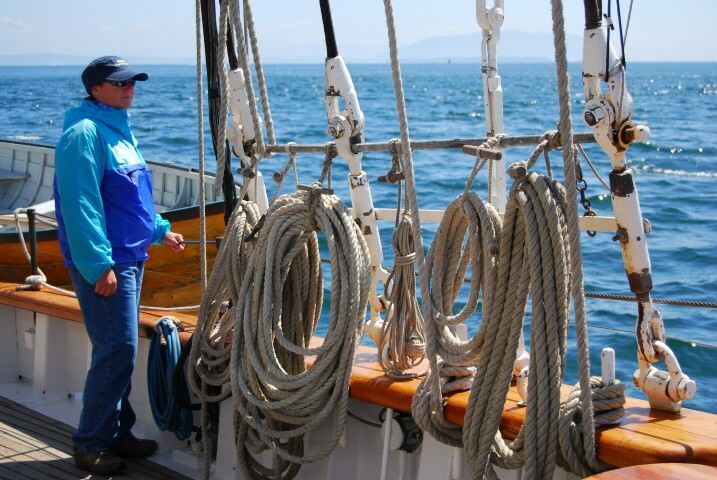 Within an hour of setting out from the dock, the wind was cooperating enough to set the sails and enjoy the thrill of maneuvering this historic tall ship for a few hours through the San Juan Islands. We had all been assigned to an experienced crew member at various stations and that’s where we would learn the ropes (pun intended) for the next few days. 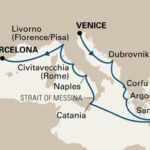 As a novice sailor, most of what was asked of me may as well have been said in an unintelligible foreign language – I was pretty clueless as to what to do. But, the well-sailed crew patiently, quickly and adeptly gave me all the instruction necessary to get the job at hand done, haul the mainsail and secure the lines. I was so glad I’d brought leather gloves to use for this event, it sure saved these soft hands. When the winds stopped, the sails were lowered and our afternoon was spent motoring towards Sucia Island where we moored overnight in Echo Bay. 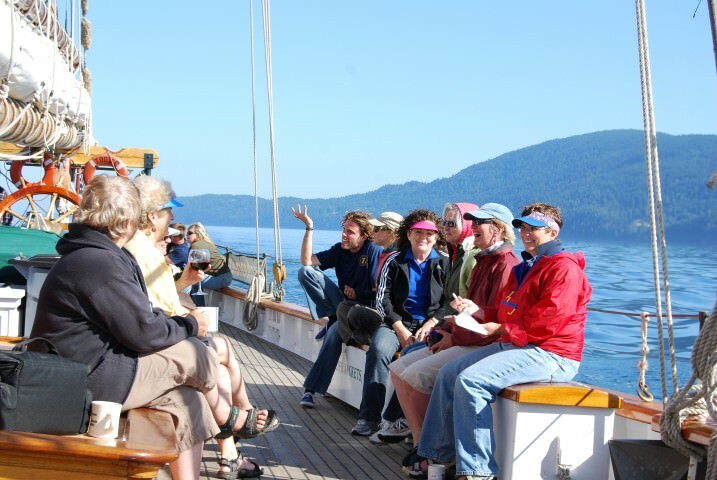 As soon as the anchor was dropped, passengers had the option to go for a paddle in one of the two tandem kayaks, find a quiet spot to read and absorb the day’s adventures, or gather around with our new friends to play games, drink wine and swap life stories. Surrounded by calm waters and a clear night, I decided to grab my sleeping bag and spend the night on deck. There’s no better way to take in this wondrous setting than sleeping out in the open while listening to the sounds of seals playing and watching shooting stars in the night sky. The two nights I spent sleeping out on deck have left a most gratifying impact on me ~ an appreciation for those that have sailed this stunning beauty. Before we even set sail, Chef Ian Relay had started prepping for lunch. In such a small galley, Ian was able to turn out hearty home-style cooking with plenty of variety to suit everyone. Lunch consisted of delicious soups, veggies, salads, pasta, wraps and fresh fruit. Dinner was highlighted with salad, veggies, rice pilaf, main courses of chicken Coq au Vin and mushroom stroganoff (the latter was so good a second helping was required) and yummy dessert. For dinner on our second evening, we enjoyed beer-braised Brats and grilled cheeseburgers along with coleslaw, potato salad and a splendid apricot cobbler. Breakfast featured items such as pancakes, sausages, bacon, potatoes and cinnamon rolls. Some of our group loved Ian’s cooking so much that they even offered to help wash dishes. Ian declined their offer as he prefers to be a one-man show! Ian even treated us to baked Brie and crackers to accompany our beverage of choice as we exchanged tales, joked with each other and played games on deck as we lazily enjoyed the afternoon in a secluded harbor. 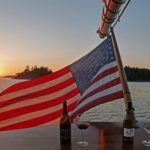 As this was a BYOB cruise, it was a great way to share a bottle of wine with new-found friends at the end of our sailing day. 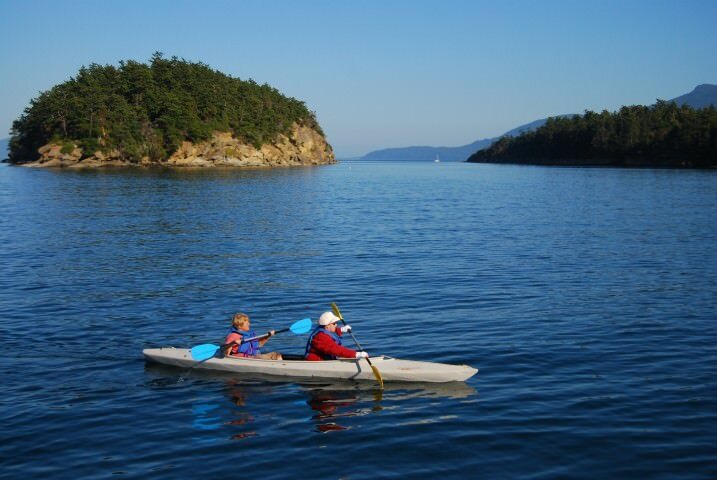 After awakening to the aroma of fresh-brewed coffee, followed by the ringing of the chow bell, I was pleased to learn that our first excursion of the day was a quick tender ride over to Sucia Island and a guided nature walk with crewmate Beth Loudon – botanist extraordinaire. 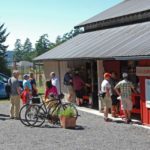 Under Beth’s guidance, we ate wild blackberries and blueberries, and learned of the ancient ways of the natives that caught oysters in the bays of Sucia Island. With winds that were nowhere to be found, sailing was not in the cards as we departed for our next destination, Roche Harbor. As we motored our way through the islands, the ever-patient Captain Tim Mehrer, rotated shifts on the helm among the passengers. Once we had our turn guiding the Zodiac along her route, it was time for the next rotation to the navigation room and a brief overview of charting a course. At some point in the weekend we also took our turn on bow watch to ensure we didn’t hit a log or run over a small boat. The tiny village of Roche Harbor was an enjoyable stop for a couple of hours. Again we tendered to the dock and had a couple of hours of free time to explore the souvenir shops, walk out to the Westcott Bay Reserve (19-acre sculpture park with over 100 sculptures on exhibit in a nature reserve), or just wander around the harbor with an ice-cream cone in hand while admiring the many boats and yachts. The remainder of the afternoon was spent motoring through the islands to our destination of Stuart Island where we would anchor in Reid Harbor for the night. Again, the kayaks were launched, the wine was passed around, the games began and the laughter of good friends filled the sea air. The on-deck barbecue beneath the clear sky was a fitting end to a perfect day. The wind gods were with us once again, and we were able to hoist the massive sails to take advantage of some good sailing weather. This day was blustery and cold, but Mother Nature could not dampen our spirits or hamper our enthusiasm for spending as much time under sail as possible. Although this weekend did not make a sailor of me (it would be foolish for me to assume I had learned any more than a smidgen of sailing knowledge), it did give me a taste for the sport and rekindled my love of being under sail. Fifteen women arrived as strangers, but left as friends. The bonding and camaraderie of the weekend is something we will all keep in our hearts and relive through our memories for many years to come. The entire experience was thrilling and exhilarating. Being on this historic tall ship and getting a taste of sailing her inspired me to want to get out and sail some more. I can’t wait to rejoin the Nauti-Girls Cruise when it sails again next year. 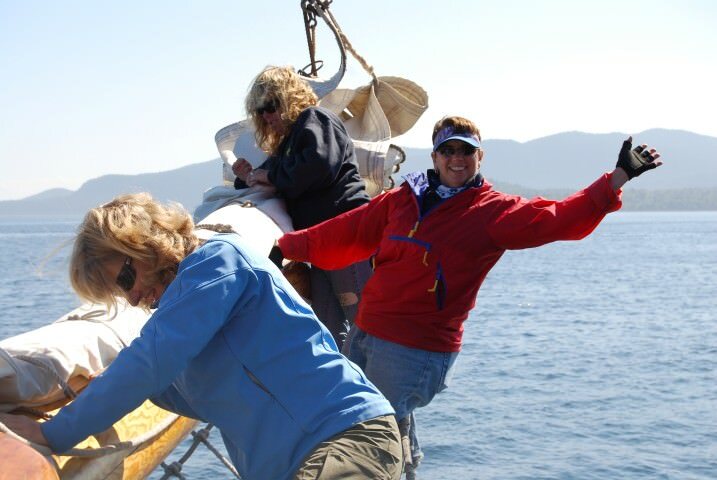 First mate and Nauti-Girls organizer, Chris Wallace who lives aboard Zodiac, is sure to make it another trip to remember.